You need the right person beside the right tree in the right light in the right city and this is love. Paula Green turns her thoughtfulness and linguistic playfulness in a new direction in her latest collection. This reflective meander around a new city – the Big Apple – is part travelogue, part essay on the nature of poetry. 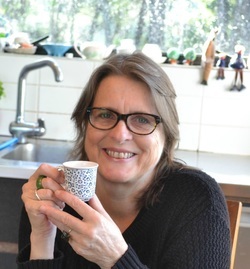 Paula Green is a poet, reviewer, children’s author, NZ Book Award judge and anthologist. She has published six previous collections of poetry, plus three collections for children, most recently The Letterbox Cat & Other Poems (Scholastic, 2014). She edited the anthologies A Treasury of NZ Poems for Children (Random House, 2014) and Dear Heart: 150 New Zealand Love Poems (Random House, 2012), and co-authored 99 Ways into New Zealand Poetry (Random House, 2010) with Harry Ricketts. She is currently working on a book about New Zealand women’s poetry. Paula is a tireless ambassador for poetry and runs two popular poetry blogs: NZ Poetry Box for children and NZ Poetry Shelf for adults.